Some less than encouraging stats there, and we are now to see to what extent has the gap been closed. Handheld chip makers have caught up and even surpassed laptops in terms of number of CPU cores and occasionally even clock speed. The Lenovo Yoga 13 is powered by a 2.6GHz dual-core Intel Core i5 processor of the Ivy Bridge variety, while the Galaxy S4 we're basing this comparison on features either a 1.6GHz octa-core CPU or a quartet of Krait 300 cores running at up to 1.9GHz in the Snapdragon 600 chipset. It's not a fair fight whichever way you look at it, due to the major architectural differences between Intel and ARM . They both have differing instruction sets, cache methods, memory management and bandwidth, among other things. Having said that, both platforms have something in common - video playback and web browsing. As such, we've let them deal with one another in our battery test to see just how efficiently each one manages its resources. We need to make a necessary disclaimer that we set the screen of both devices to about 150lm to have them on equal footing. Additionally, since Windows 8 offers different power management setups, we've set the Lenovo ultrabook on High performance to let it unleash its full potential and manage the available CPU and GPU resources itself. In terms of web browsing, the Galaxy S4 rather predictably beat the Lenovo Yoga 13, by over 2 hours. The Galaxy S4 finished the test in 7 hours and 24 minutes of continuous web browsing, whereas the Yoga managed 5 hours and 7 minutes. Here, the smaller screen and less powerful, but more efficient CPU take the credit. Had we compared the Yoga ultrabook with one of the Web browsing battery test champions (HTC One), the difference in score would've been close to double. In the video component of our traditional battery test, we play a movie at SD quality. This is so that we can give equal chance to low- and mid-range devices against the premium offerings on the smartphone market. But since this isn't a usual test, we chose to play a more demanding 720p .MKV file with x264 encoding. As you can see in the results below, the Galaxy S4 posts more than double the time of the Yoga 13, at nearly 9 hours of continuous 720p video playback (8:56h to be exact). The Lenovo Yoga on the other hand did rather poorly in comparison getting the measly 3:52 hours. So as far as consuming content on the go is concerned, smartphones have an advantage and a pretty big one at that. It has always been this way and that's hardly surprising, but there's a change in the big picture you should consider. While previously laptops could take consolation in the fact that they could at least support more content (video codes, more complex web pages etc. 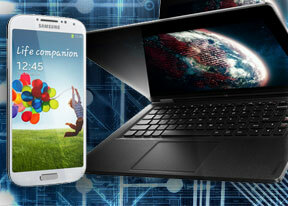 ), devices like the Samsung Galaxy S4 have eradicated much of that advantage. And don't get fooled to think that the endurance difference is entirely down to the difference in screen sizes. After all laptops have a lot more room to fit larger batteries and, in this case at least, they don't even have as many pixels to worry about. We also ran our traditional loudspeaker test on the Yoga 13 for a good measure. It scored a Below average result, which is strange considering that laptops have enough space to house much larger speakers than those found on smartphones. However, it's very important to note that the Lenovo offers far clearer sound, which is going to be far more important to many. You can find more about the testing process here.